Well, it looked wet up at the Derwent Dam in the Peak District but apparently all attending appeared to consider it well worth the effort. Well done to all the 570 who turned out to evidence public fury over the continuing illegal persecution of raptors. 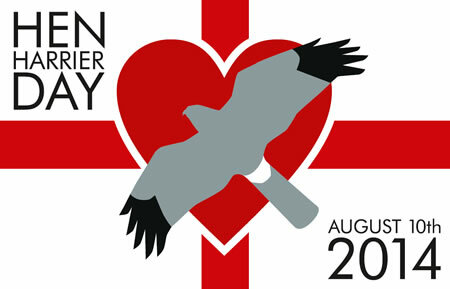 Hen Harrier Day 2014 has certainly provoked a media campaign by the likes of the Moorland Association, whose claims were quite astonishing and it was a great shame that the BBC reporter hadn’t the committment to test Ms Anderson’s assertions that driven grouse moors are great for HHs. Having said that they would be perhaps, except for the issue of criminals at work or play on those same driven grouse moorlands? Therein lay the failure of Faith Wilkinson, or that of her script writer? Chris Packham did the campaign proud, no lies no selective reporting …. judge for yourself here. An excellent analogy was made by the Shadow Minister Barry Gardiner who described the area as a Bermuda Triangle for Hen Harriers. Charlie Moores BAWC called for it to stop now, not eventually if the draft Hen Harrier Recovery Plan ever materialises …. seven years in the gestation, the egg is addled from so much rhetoric and hot air? Mark Avery in his Standing up for nature blog, comments on Jim Dixon the Chief Executive of the Peak District National Park’s writing in Saturday morning’s Times newspaper that “…a bird that has a proven disruptive influence on wild grouse exists uneasily with raising large bags of grouse for sport. The naturalists will be angry tomorrow, but it’s hard to see anger doing any practical good for hen harriers. Enlightened moorland owners and a new generation of keepers who show respect for nature hold the future of this special bird in their hands‘” as being presumptious and suggestive of an “unnecessarily understanding of the criminal activities that have reduced hen harriers to such low numbers in the English uplands, and unnecessarily dismissive of the views of the people whose taxes pay for the National Park activities.” As Avery further mentions, Dixon’s comment must surely be in a personal capacity? One thing is for sure …. the epetition signatures slowly creep towards the target 100,000 today there are 13,487 a significant increase on the last day or so. Sadly to stay on the topic of animal persecution …. Paterson departed calling environmentalists “Green blobs” but it seems that his successor Liz Truss MP is carrying on the ConDem persecution of badgers regardless. The Badger Trust are appealing to people to support and join us for the Colchester March Against The Badger Cull this Saturday, 16th August 2014. This march is the last to be held before Badger Trust takes DEFRA to judicial review on 21st August and could also be the last before killing resumes in Somerset and Gloucestershire this year. As always, your attendance is extremely appreciated and important in making these events a success. Please bring family, friends, buggies, dogs, all welcome. 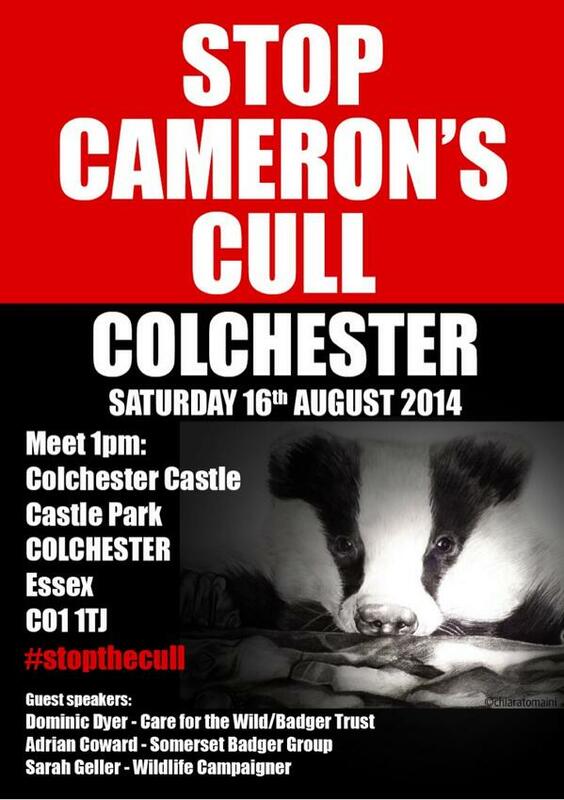 The organisers ask that everyone assemble at 1pm at Colchester Castle, Castle Park, Colchester, Essex, CO1 1TJ. Guest speakers include Dominic Dyer CEO of Badger Trust& Policy Advisor for Care For The Wild, Adrian Coward of Somerset Badger Group and Sarah Geller, Wildlife Campaigner. It’s not exactly on our doorstep, but it is a peaceful protest in support of protecting an iconic species of the quintissential English countryside. If readers are unable to get then perhaps they could be persuaded to circulate the appeal and notification to their friends, family and network contacts. Poor brock deserves fair hearing of robust science but there are those in power who seem to disguard what doesn’t suit their case? Readers might be minded also to consider writing to their MPs, to the new Minister Liz Truss MP to ask for a rethink? Hen Harriers and badgers, to see either or both are truly memorable and magical moments, they deserve a future. Help us make sure that future generations too can experience those same magical moments.